Success for Actikem at the Chemicals Northwest Awards! It was a night of celebration for Actikem at the Chemicals Northwest 2017 Awards, held at the Liverpool Crowne Plaza Hotel on the 30th March. They were delighted to receive a ‘Highly Commended’ Award in the category of ‘Supply Chains Award’. 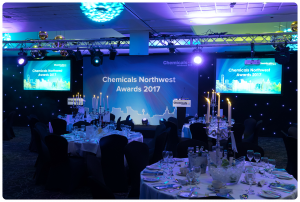 The Chemicals Northwest Awards Event celebrated the achievements of local businesses, operating within the largest regional chemicals sector in the country. Trevor Gleave (centre), Operations Director at Actikem Ltd, with Dianne Oxberry (left) Host, and Simon Marsh, Director of the CIA (right). 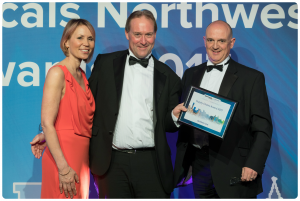 Trevor Gleave, Operations Director, who collected Actikem’s Award from the host, TV broadcaster Dianne Oxberry, commented ‘We are delighted to have received this recognition from Chemicals Northwest. Thanks to our dedicated and skilled staff, and the support from our customers and suppliers, we continue to go from strength to strength, and are always seeking new ways to develop and improve our business’. Chemicals Northwest (CNW) is a thriving business networking organisation that works with the chemistry-using industries of the North West and surrounding area. They are funded by their members and are part of the Chemical Industries Association.